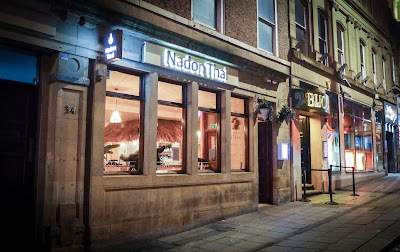 I have found that locating good Thai food in Newcastle is as elusive as the Higgs boson. 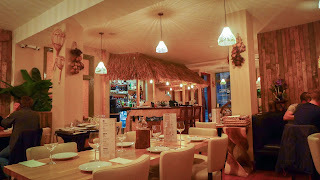 More so, in fact; apparently the latter has now been found, while my search for somewhere that can approximate to real Thai cooking has gone on in vain. On each of the last two episodes of this quest, disaster struck. First at Mantra, and then at The Old Siam, my hopes were dashed on the rocks of inept cooking and duff ingredients. My one-star review of The Old Siam resulted in a raw convulsion of rage on The Chronicle’s Facebook page. Apparently, a lot of people like this place and took the review quite personally. Bless. I only wish I could have reviewed the meals they had all enjoyed so much, or that they could have seen how abject mine was. Anyway, it gives me no little pleasure to bring better tidings this week. Thanks to a new incarnation of an old friend, things are looking up on the south-east Asian front. Nadon Thai opened up on Newcastle’s Mosley Street in March. It’s the third restaurant in the group, joining outposts in Morpeth and Durham. Mrs Diner and I enjoyed most of what we ate at the Morpeth original a couple of years back, so my fingers were crossed as we, and a friend who joined us for the night, were welcomed in from the dark with an enthusiastic round of wai bowing. The place has been done out to look a bit like a beach hut on Ko Pha Ngan, lacking only a few hundred mushroom-addled backpackers and some banging psy-trance in terms of delivering a truly authentic experience. The menu is a big one, but helpfully features pictures of the dishes for those who don’t care to read. As the food began to arrive I was impressed by the fact that what we were served bore a good resemblance to those pictures. A lot of it tasted pretty good too. 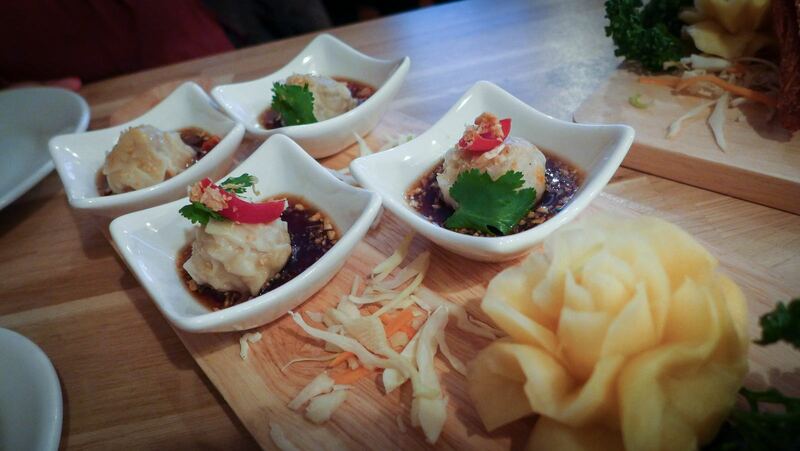 Shumai - steamed dumplings of prawn and pork - were pillowy bundles of goodness, their filling fresh and lively. 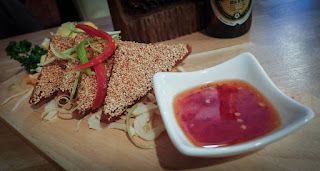 I really enjoyed the almost shockingly sweet accompanying soy dipping sauce that was like an Asian version of salted caramel. Nostalgia dictated that we order the prawn toast. A decent smear of blitzed-up shellfish and a good dose of sesame seeds made these enjoyable enough, although pretty greasy. 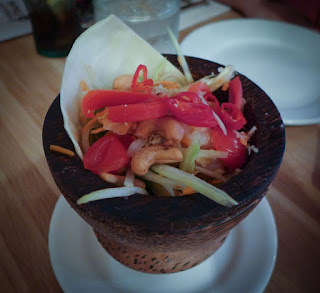 The papaya salad was not so successful, lacking the contrast of chilli fire and refreshing crunch that marks this out as one the world’s truly great salads. It arrived in a wooden mortar, which made accessing it a unwanted challenge. #wewantplates indeed. My main of ginger steamed sea bass was a solid contender rather than a knock out champ. 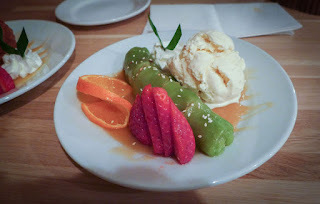 The ginger was soothing and restorative while the sauce had a palate-awakening sourness. However, the fish itself didn’t taste like the freshest specimen, the flesh being slightly pappy. 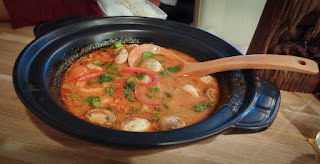 Dish of the night went to our companion’s prawn tom yum hot pot. This murky bowlful possessed everything I look for in Thai cooking. I am happy to recommend this place for this dish alone. Prawns bobbed in a ferociously hot soup, which was the colour of fury, but also possessed sweetness, sourness, bitterness and saline funk in addictively well balanced quantities. As beads of sweat gathered in places they don’t often, I breathed a sigh of relief. The search was over. Mrs Diners’ main of “weeping tiger” was a hot-plate sizzlefest in which garlic and chilli did most of the heavy lifting in a darkly savoury sauce. 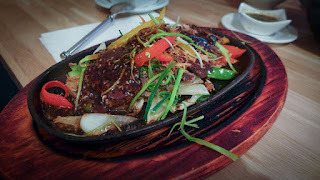 This was enjoyable, although probably the most westernised of the savoury dishes we tried. The two puddings we shared were equally successful. Goblin green pandan pancakes contained some quite delicious coconut toffee. 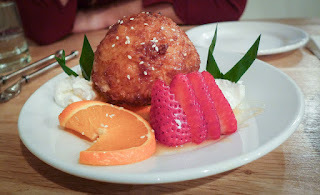 Elsewhere, another pang of nostalgia for the “Asian” meals of my youth determined that we order a portion of deep-fried ice cream. The resulting orb justified the dictum that nothing cannot be improved by coating it in batter and bunging it in the fryer until it floats. They have a decent list of wines, including some from Thailand. The bill came in at just over thirty quid a head before wine, inclusive of service, which was absolutely charming, although getting bowed at quite so often as this always takes me a bit to get used to. It must be the post-Imperial guilt or something. If you’re in the market for value, then a two course happy hour special for under thirteen pounds is available, although it’s not clear from the website when the happiness starts or finishes. Give them a ring to find out. Praise be! 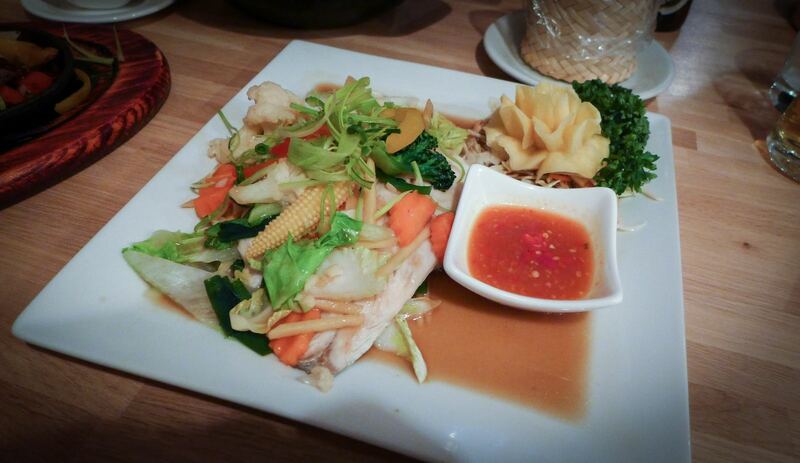 - there’s a Thai restaurant in town to which I’ll happily return. Not everything was brilliant, but there were flashes of the intense, beguiling and contrasting flavours that this most wonderful cuisine offers, and that’ll do for me. About flipping Thai.